We take your concerns very seriously and would like to follow up with you to learn more. Unfortunately, we are unable to locate your account with the information provided. Please email your concerns and account information to customersupport@empiretoday.com so that we may further assist you. So we spent the weekend preparing our house for our carpet installation from Empire Today. We made this appointment 30 days ago. They confirmed last week. All of my furniture is under a tarp on my deck. Today they call me and cancel the installation because they overbooked? When we made this appointment, the day "was wide open." They told us there was nothing they WOULD do about it. Spread the word! This company has the worst customer service. 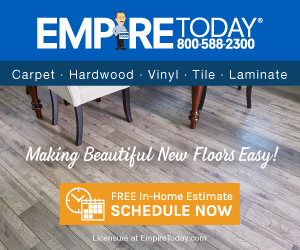 Product or Service Mentioned: Empire Today Customer Care. Review #905414 is a subjective opinion of User905414. We understand that your time is valuable and sincerely regret that you were inconvenienced by a missed installation appointment. We want to help, but are unable to locate your account with the information given. Please email us at customersupport@empiretoday.com with your account and contact information.